Duet-ed had an incredible run this January as part of The Exponential Festival. Check out the review from No Proscenium by clicking here. For more information on Duet-ed, visit the show page by clicking here. Casting for Duet-ed is complete and tickets are now on sale! Duet-ed is a site-specific, interactive performance on intimacy, fidelity, and desire, comprised of a sequence of one-on-one experiences between a single attendee and a performer. The cast of Duet-ed includes Jack Blackmon, Sandie Cheng, Chris Ignacio, Vanessa Koppel, J Moliere, Taylor Myers, Cristina Pitter, Nicole Pursell, and Niko Tsocanos. The production is designed by Aaron Amodt, and is created and directed by Cori Marquis and Nic. Music arranged and performed by Jack Adams. Six consecutive one-hour long performances of Duet-ed will take place on Fridays in January (4, 11, 18, and 25) from 12pm - 6pm at Vital Joint, located at 109 Meserole St., Brooklyn, NY 11206. Performances begin at the top of each hour for a maximum audience of five. Tickets, priced at $25, can be purchased by clicking here. For more info, check out our recent announcement on Broadway World. The Exponential Festival presents Duet-ed by What Holds Heat. Coming January 2019 to Vital Joint! “‘Stiff Drink! ?’ with Dr. Eustice Sissy (Psy.D. ), presents: ‘Songs from the Heart’” is coming to Dixon Place on Saturday, November 3rd at 10pm. Get your tickets by clicking here. The Exponential Festival is fundraising with Kickstarter. Please consider making a donation by clicking here. In a bit of publishing news, two of Nic's short poems will be published in the inaugural issue of Edwina Baxter’s zine, Avantlanche. Thanks to editors Eliza Bent and Thomas Bane. This first printing is a very limited edition, but look for updates about purchasing a copy here. On 8/24 from 8pm - 12am at Vital Joint as part of Title:Point’s annual salON! Nic will be sharing space with the likes of Title:Point, Cristina Pitter, Emilyn Kowaleski, William Burke, Jill Melanie Wirth, Walter Wlodarczyk, Hannah Kallenbach, David Pym, Peter Mills Weiss and more and more! (g)hosted by CATFOX. Admission is pay-what-you-will, cash only, at the door. More details here. On 8/26 at ApartmentPARTY from 7pm - 10pm, multitalented unicorn Miller Pyke is hosting a salon at her apartment with performances by Shon Arieh-Lerer, Jaime Wright, and Nic. Entertainment befins at 8pm. Seating is limited, admission is free, BYOB. More details here. And on 9/10 from 7pm - 8:30pm at The Tank, Nic's salon, HERETOFORE UNSEEN will make its third showing with a crazy lineup (TBA). Tickets are $5 and can be purchased here. More event details here. Coming up in May, Nic is sharing new writing from his upcoming piece, The Comfort Illusion, at two programs. The first is Wednesday, May 2nd at 7pm at a show called FEAST, a monthly variety series at Under St. Marks. Nic will be sharing 15 minutes of new material alongside a couple other artists. Aside from programming awesome performance, each FEAST comes with - you guessed it - a menu of snacks meant to accompany the performances! Get more info by clicking here. The second is Wednesday, May 23rd at 7pm at HERETOFORE UNSEEN at The Tank. This is a new salon Nic is producing, where performers get gutsy and share brand new work. Get advance tickets by clicking here. Nic's producing a salon of all new work on Monday 2/19 at 7pm at The Tank called HERETOFORE UNSEEN, featuring Siren Denizens Rebecca Robertson, Nicole Pursell, Javan Lee Nelson, and new friends Cristina Pitter, Jerome Ellis, Charlotte Mundy, and Title:Point. Get more info and tickets by clicking here. 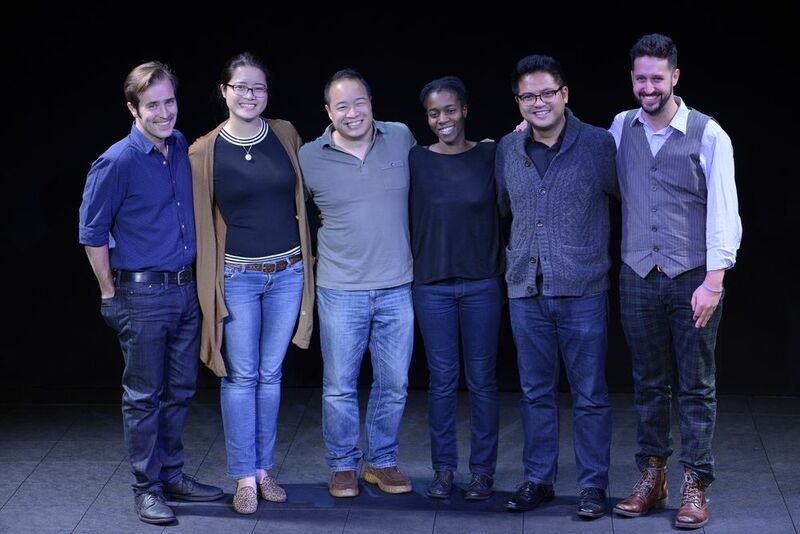 Nic was in residency at IRT Theater with a new play called Holy Name, by Michael Eichler. Check out more photos from the work-in-progress showings by clicking here. Target Margin Theater has commissioned Nic (and 39 other artists) to create a short play in celebration of the opening of their new theater - The Doxsee - in Sunset Park, Brooklyn. Nic's new dramaticule will play on November 10 at 7pm, and will feature the writings of Mary Baker Eddy on the subject of home, a campsite, and will be performed by J Moliere and Nicole Pursell. Buy tickets by clicking here. Paul Ketchum, writing for Culturebot, thinks about Icarus, which makes him think about Bond movies, Emily Dickinson, and more. Click here to read the review. Do you have your tickets for Icarus in the L.E.S. at Joe's Pub yet? If not (or if you'd like to buy duplicates, just in case), click here. Duet-ed is an intimate sketch in dance-theatre etudes on monogamy, mating, betrayal, and performance intended for an audience of one at a time. Work in progress showings are June 4 and June 12, starting around 9:15pm (show up at 7:30pm to see other great new works on the bill). All performances are at Vital Joint at 109 Meserole St, Brooklyn, New York 11206. Nic and choreographer Cori Marquis (who've worked together before on Icarus and White Wines) are teaming up again to present a new dance-theatre piece, Duet-ed, which will have its first work-in-progress showing at Vital Joint's second annual ?! :New Works Festival in June! More info to come! Icarus in the L.E.S. is coming to Joe's Pub on Thursday, August 24th. Buy tickets by clicking here. Thanks to everyone who came out to The Performing Garage this weekend to check out Oye Group's (fka Brooklyn Gypsies) exhibition of new multimedia designs for Icarus! Next stop, Astor Place! Great photos of Nic's recent shows have been added to the Works page above! Check out Nic's interview with AXS.com by clicking here! Nic's Indiegogo for Icarus in the L.E.S. (full-length premiere) is live here. Donate if you can! - Icarus in the L.E.S. (1.20.17 - 1.28.17) will have its full-length premiere at JACK as part of Brooklyn Gypsies' One Catches Light festival. This run will feature the unendingly soulful and charismatic Ronald Peet. Tickets are available here. - Yours Untruly (1.12.17 at 7:30pm), a new musical from Nic, Keaton Morris-Stan, and Ann Marie Dorr, with original music by Jack Adams will have a work-in-progress showing at Dixon Place. Tickets are available here. - Who Made This? Collaboration, Credit and Intellectual Property in Theatermaking (1.18 at 2pm) is a panel discussion for The Exponential Festival, co-curated by Sarah Hughes. For more info, click here. - Real Talk / Kip Talk (2.20.17) is a live talkshow written by media mogul Kippy Winston, to receive a special one-night-only presentation at Abrons Arts Center. Nic will be directing. For more info, click here. Howard Fishman's A Star Has Burnt My Eye is coming to BAM's Next Wave Festival in November 2016! Nic will continue with the production as its Production Stage Manager. - Icarus in the L.E.S. at Interrobang: New Works Festival on 4.10 and 4.16, produced by Title:Point. Featuring performance by Isabella Sazak. Get more info by clicking here. - Afterward by Sam Goodman, as part of Columbia University's MFA Playwriting Thesis Presentations at Signature Theatre. Nic will be assisting director Sarah Hughes. - Porgy and Bess at Spoleto Festival USA in Charleston, SC. Nic will be assisting director David Herskovits. 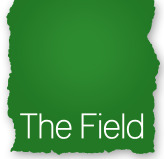 Nic is now a fiscally-sponsored member of The Field. Make a tax-deductible donation to Nic's upcoming work by clicking here. Stay tuned here for news of Nic's upcoming projects. In the meantime...catch up on the previous incarnation of Icarus in the L.E.S. by clicking here. TRE logo designed by Muneera Gerald. Nic has been selected as Theater Reconstruction Ensemble's TRE|haus playwright-in-residence for his performance-poem, Icarus in the L.E.S., which will receive a week of rehearsals and workshops in the fall of 2015! Get more info by clicking here. TRE is a fantastic NYC theatre company, having produced some awesome plays like Set in the Living Room of a Small Town American Play, and You On The Moors Now. In addition to his work with them on Icarus, Nic is currently workshopping their next "reconstruction", Rhinbecca, NY, serving as the production's creative stage manager. Rhinbecca will play at The Brick Theater in Williamsburg in the spring of 2016. ...other things also brewing. Look out! Julia Sirna-Frest, Paul Ketchum, Andrew R. Butler, and Bronco in Comfort Dogs. Nic joins William Burke's production of Comfort Dogs: Live from the Pink House as stage manager. Get tickets by clicking here. Zazie Beetz and Danielle Hecht in White Wines (after Plays), part of Target Margin Theater's Labs. Photo by Erik Carter. 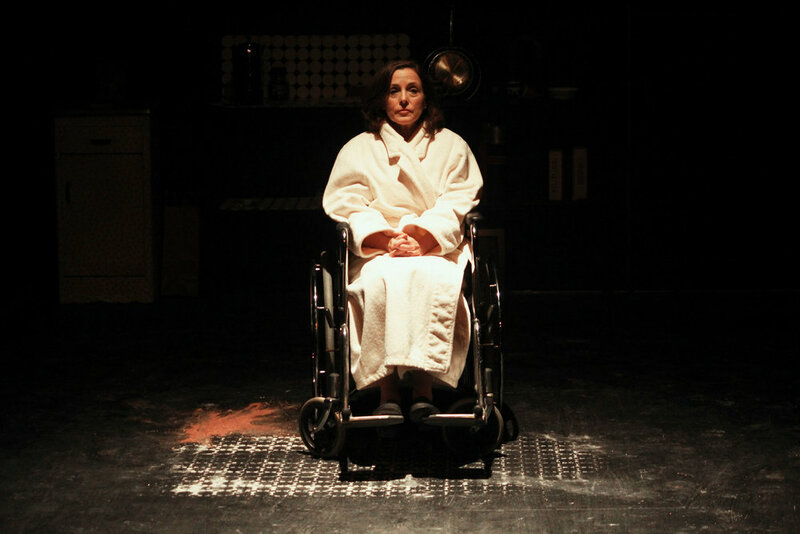 White Wines (after Plays) had a great run at The Bushwick Starr as part of Target Margin's Labs. The Gertrude Stein Labs continue until February 7th! See more great riffs on Stein's writing by clicking here. Read up on Talking Band's upcoming production, The Golden Toad, by clicking here. Nic will serve as the production's stage-manager. Buy tickets for Nic's upcoming piece, White Wines (after Plays) by clicking here. Nic's piece runs as part of Target Margin Theater's Gertrude Stein Labs, a festival featuring the work of many talented artists. Nic got to share his history with Target Margin for their year-end appeal. View it by clicking here. - Nic will be reading the role of Pentheus in Jesse Freedman's Karaoke Bacchae at La MaMa Theatre on October 28th. - Nic will be directing a reading of Michael Eichler's new play, Holy Name. To be read at 9pm on November 12th at the 13th St. Repertory Theater. - Nic will be expanding his Six Church Poems into a concert event to play in Dixon Place's Lounge on November 20th at 7:30pm. Get more info by clicking here. - Nic will be directing Gertrude Stein's play White Wines for Target Margin's Gertrude Stein Labs at The Bushwick Starr in January 2015. Nic with fellow shadow directors and directors at ABC's Diversity in Casting Showcase at New World Stages. Next up, Nic will be assistant directing for ABC Creative Talent Development, as they prepare for a showcase in October. Nic has been asked to preview some of his new piece, Six Church Poems, at Dixon Place's "Experiments and Disorders" poetry series on Tuesday 9.16 at 7:30pm! The free work-in-progress showing will include music and poems from the upcoming piece, which will receive an expanded showing in November. Get more info by clicking here. Opening of Pipeline Theatre Company's Clown Bar, running every Saturday at 7:30pm at The Box. Get tickets by clicking here. Rehearsals have begun for Julia Jarcho's new play, Nomads. Click here to check out our recent feature in The Brooklyn Rail, and get your tickets by clicking here. Click here to check out Nic's interview with Target Margin Theater's intern, Sarah Suzuki, on the process of making Uriel Acosta. Click here to check out American Theatre Magazine's article on Target Margin.